How It’s New York: Dylan Thomas, who wrote the short story that underpins A Child’s Christmas in Wales in Concert, running at Irish Repertory Theatre through Dec. 31, died days after a drinking binge at New York’s White Horse Tavern in Greenwich Village in 1953. The show is directed by Irish Rep’s Charlotte Moore, Musical Direction by John Bell. How It’s Irish: It’s Welsh, so Celtic anyway. 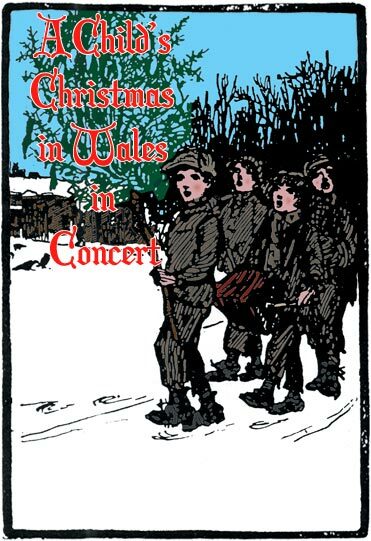 Besides, the romantic evocation of perfect childhood Christmasses in Wales, it echoes Joyce’s Dubliners in the symbolism of the snow—at a time (in the1920’s) when, to hear Thomas tell it, “there were wolves in Wales”. And “it was always snowing… but that was not the same snow” as snow now. “cats in their furabouts”; “books that told you everything about the wasp except why”; “the teatray-slithered run of the chilly, glinting hill”. My question was how could the Irish Rep inject enough dramatic tension into this sweet story to make of it a play? Amazingly well. Apart from having multiple characters tell the boy’s tale (Ashley Robinson plays Dylan among a cast of five) and interspering it with Christmas songs, a dramatic climax is created when Dylan and his boyhood friends go caroling. Was that a haunted house or another imagined aspect of his recall? Either way, we are jumping when the boys scream. “And when we stopped running we were back outside our house,” he says. They sing Silent Night “the way it should be sung,” followed by a Welsh song in praise of “a clean heart”. Not a creature was stirring during what was for most of the audience the first time they had heard a Welsh song. It brings home the whole point of the Christmas tradition. Yes, it entails mandatory food that no one seems to like–cockles and fruit cake, in Dylan’s case. Yes it means facing annoying relatives. And, per the refrain of one song, it is “each year the same”. But the comfort of family is better than the alternative, the dark abyss beyond. “the holy darkness while the distant cries from the room below comforted my rest”.